This is the final page of my adaptation of H.P. Lovecraft’s “The Doom That Came to Sarnath.” If you want to read them all in order, page 1 is here, and you can follow them through the archive page. Thanks to the Kickstarter backer who asked me to illustrate this story (you know who you are)! It was wonderful to draw. What’s next? “Hypnos”? “Nyarlathotep”? “The Green Meadow”? Well-l-l… I’m actually deep in the dungeons of several new projects which I will announce on this site tantalizingly soon! Meanwhile, I’ve been working on D&D strips at the Wizards of the Coast website, as well as some local projects, a tabletop game, and comics for the Summer 2013 horror anthology The Sleep of Reason and another anthology. And I’ve also got some new and old artwork to put up on the site in the intervening weeks. But what about Lovecraftian stuff? In that realm, although it isn’t exactly a new project, I will be releasing an ebook of “The Dream-Quest of Unknown Kadath and Other Stories”, details TBD. Also, I’m working on a BIG Lovecraftian comic project. If you want to know more, I talk a little about it and other new projects in the latest The Double Shadow podcast, discussing Clark Ashton Smith’s short story “The Tale of Satampra Zeiros”! 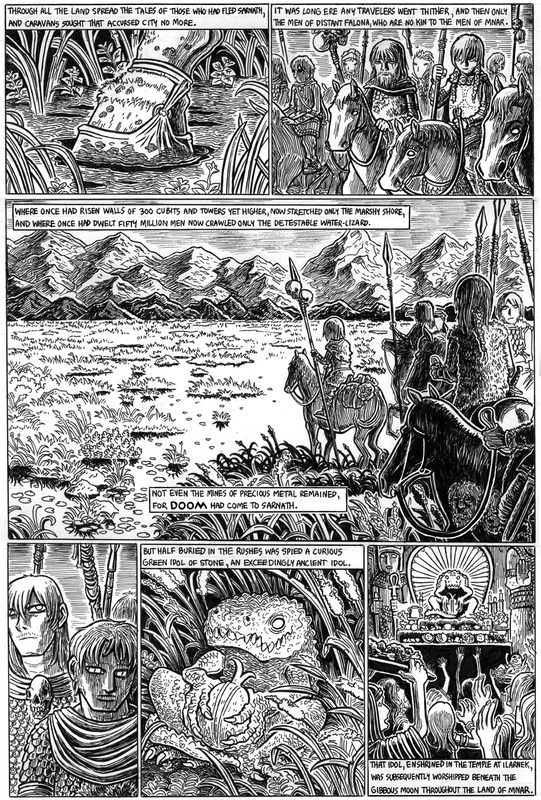 This was the comic that I adapted as “Hyperborea” awhile back, and the fellow Smith fans at The Double Shadow kindly invited me to join them on their podcast and step all over their lines as we discuss Smith’s antediluvian world and the fine points of Tsathogghua worship together. Go listen to it now, and if you at all like horror or fantasy, I strongly recommend you make it one of your regular podcasts. See you next week, and thanks for reading! congrat on finishing this story and eagerly awaits next one. Congrats, this is a good ending! My, Lovecraft sure talked about gibbous moons a lot, didn’t he? The one slightly incongruous element is that the idol looks much bigger in the last panel than in the panel before. I found I can listen while doing other things though a quiet mind is needed from-time-to-time. You can’t tell the size of the idol be the grasses so there is no real measurement to got by till the last panel. The pre-(known)history of Lovecraft was certainly more advanced and a having a city of 50 million is staggering. We don’t have such megalopolises yet today. Maybe 50 years from now. Yeah, 50 million is a pretty enormous city, isn’t it? Perhaps that was the size of the whole kingdom? Then again, cities~kingdoms, I assume it was a city-state. I considered drawing actual modern technology in the pre-collapse Sarnath, steam and gasoline engines and so on, but thought that’d take us out of the mood (and wasn’t in the text). Jason, you knocked the ball out of the part with this one. Similar to how the 1977 Ranking and Bass “The Hobbit” cemented my vision of middle earth, your vision of Sarnath has solidified the vision of my my favorite Lovecraft story. Thanks Matthew! It was a ton of fun to draw. I’ll be selling some of the original pages in the online store eventually, after the person who sponsored “Sarnath” takes his pick. That comic is really GREAT, I like your drawings very much! Will it be available as printed version? I’d definetly like to buy that one. Great job, really enjoyed it.